Following a preview at Integrated Systems Europe in January 2014, Martin Audio officially launched the multi-purpose DD12 powered loudspeaker at Prolight + Sound Show 2014, Frankfurt. The DD12 was designed to define the ultimate in performance and versatility for powered, two-way loudspeaker systems. It combines onboard networking, DSP and Class D amplification with state-of-the-art transducers and Differential Dispersion horn technology to achieve best performance in terms of fidelity, output capability and coverage consistency across the audience. The DD12 is designed to meet a multitude of premium stand-alone and distributed sound reinforcement requirements — from touring, theatre and portable live sound applications to concert hall and house of worship installations, AV events and stage monitor use. 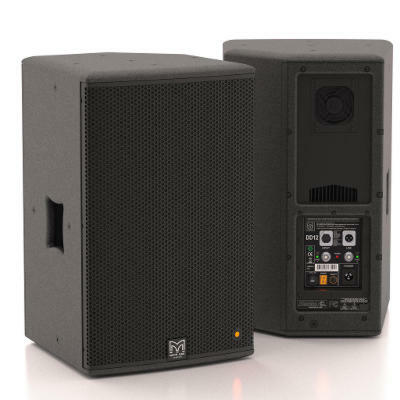 Suitable as the main PA in small-to-medium size rooms, it can also be used as an infill loudspeaker in large-scale systems. Whether configured as an element in a stand-alone DD12 system or part of a larger MLA/MLA Compact system, individual DD12s can be controlled and monitored from a laptop or wireless tablet PC via intuitive VU-NET proprietary software. PC connection can be made directly via USB, or via Martin Audio’s proprietary U-NET network and Merlin loudspeaker and network management system. An important feature of the DD12 is its internal memory, which allows a choice of factory presets or user-generated DSP preset ‘snapshots’ to be recalled by means of a preset selector button on the rear panel, instead of using computer control. In addition, comprehensive accessories support a wide variety of mounting options – including surface, ceiling (M8 rigging inserts) and pole mount. The DD12’s universal bracket facilitates a wide range of down-tilt and up-tilt angles in both portrait and landscape orientation, and can be mounted directly onto the pole of a speaker stand or attached to a scaffold clamp. The DD12 festures a compact, multi-angle, polyurethane-coated plywood enclosure with screw-free perforated steel grille and runs on a switched mode power supply with PFC (Power Factor Correction) and global mains operation. According to Martin Audio it is 'not unlikely' that a matching subwoofer will be releasead soon.